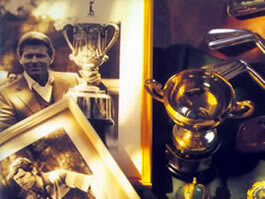 Graham Marsh Golf Design (GMGD) is regarded as one of the world's leading Golf Course Architects. Since forming in the mid 80's, GMGD has been responsible for a number of the world's leading Residential, Resort, Private and Tournament golf courses. The Graham Marsh Golf Design team, with over 30 years service to the industry, is one of the most qualified and experienced Golf Course Architects world wide. The completion of over 50 golf course designs, with a further 20 or more courses at different stages of development throughout the world, further endorses Graham Marsh Golf Design's capabilities to provide clients with World Class Golfing Facilities. Golf Digest Magazine, awarded GMGD “Best New Private Golf Course” in 2004 for Sutton Bay Golf Course in South Dakota USA. The winner of 64 tournaments internationally and successful on all five of the world's major tours, Graham has been one of Australia's most successful golfing ambassadors since turning professional in 1969. As a Golf Course Owner, Graham's commitment to Golf Course Architecture is exemplified by his personal involvement and professional input to every stage of the golf design process. Awarded an MBE by her Majesty Queen Elizabeth II as recognition for his services to golf, Graham continues to share his experiences and professional knowledge to each client that actively seeks a sustainable golf course development. 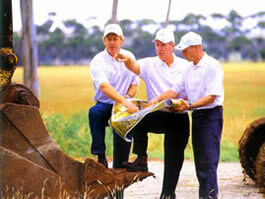 Graham Marsh is an honorary member of the Society of Australian Golf Course Architects. Our Golf Course Architecture services can be tailored to meet the requirements of any client and development brief. Our diverse Golf Course Design Services and procedures assure each client of inspirational and effective planning practices, detailed documentation and professional design implementation. Graham Marsh Golf Design provides detailed analysis and functional solutions to Golf Course Master Planning and assistance with information regarding Golf Course feasibilities. 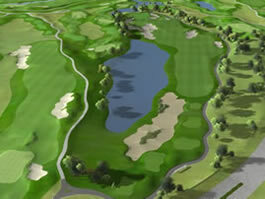 Graham Marsh Golf Design utilise the latest 3D modelling and engineering software. This allows the Golf Architects vision and design representations of the golf course to be digitised and generated into accurate digital terrain models for construction and quality assurance purposes. This technology provides the client with very accurate documentation and provision of detailed quantities essential for successful tendering and construction of the Golf Course Design. Our portfolio of Golf Course Projects is currently represented throughout 16 countries. These include the very traditional inland links of Sutton Bay in the USA, to the serene parkland golf courses of Hua Tang in Beijing and Jura in Germany, the beautifully manicured Resorts such as Fairways and Bluewater in the Philippines and Sutera Harbour in Malaysia. Horton Park / Maroochy River Golf Club redevelopment is in the final stages of construction and grassing and is anticipated to be completed late in 2014. Click on 'read more' to view the Flyover of the Course. A $1.4 billion resort in far north Queensland has been approved by the State's coordinator general. 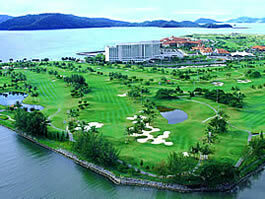 The new Sutton Bay Golf Course has been voted the No.3 Golf Course Development of the Year 2012, worldwide. Ras Alhamra - Oman's first completely floodlit 9 hole Golf Course - playable as 18 holes with multiple Teeing positions and alternate Green locations.